The one word that comes to mind when I think of tri-color cookies is LOVE! I have been completely crazy about these little gems since childhood. Maybe it’s because they’re so colorful, or maybe it’s because they look like little presents! I would always wonder how they could get all those colors in one little cookie, and more importantly how anything could taste sooo delicious!? Every time my mom would take me to the bakery, which to me was like going to a party, I knew exactly what I was going to get. I didn’t want any part of anything else. Well except for maybe a whipped cream eclair, or a piece of that heavenly banana cream pie from Conte’s bakery. Okay that’s another blog post… Now back to the tri-colors, if the bakery was out of them complete devastation ensued. I know I tend to be a bit on the theatrical side, but they are the best thing in an Italian bakery. If I was going to get technical I would say that they are more of a petit four than a cookie due to the fact that they are three thin layers of almond flavored sponge cake layered with raspberry jam and enrobed in chocolate. Some bakeries layer them with apricot jam and marzipan, but that just doesn’t cut it for me. My recipe is pretty quick aside from the fact that you have to bake the three layers separately. Don’t let that deter you, they are worth every minute you spend making them! Pre-heat oven to 350 degrees and grease three 8×8″ pans. Cream almond paste, butter, and sugar in mixer till light and fluffy. Add eggs one at a time and then extract. Fold in flour, baking powder, and salt. Divide batter evenly(1 cup each) into 3 separate bowls. Color batter and pour into prepared pans. Bake for 10-12 minutes till cakes start to pull away from edges. When cakes are completely cool stack layers and fill with jam. Melt butter and chocolate in a double boiler and add corn syrup. Pour warm glaze over cookies. Refrigerate for a few hours and then slice. These cookies should be kept refrigerated and can be frozen for up to 2 months. >Thanks Abeer! The more pink the better! >How adorable! These would be perfect for a tea party or a shower! >This looks delightful! Love the three flavors, especially the almond! Fun post! >Oh wow! These look amazing! >You have just answered my prayers. 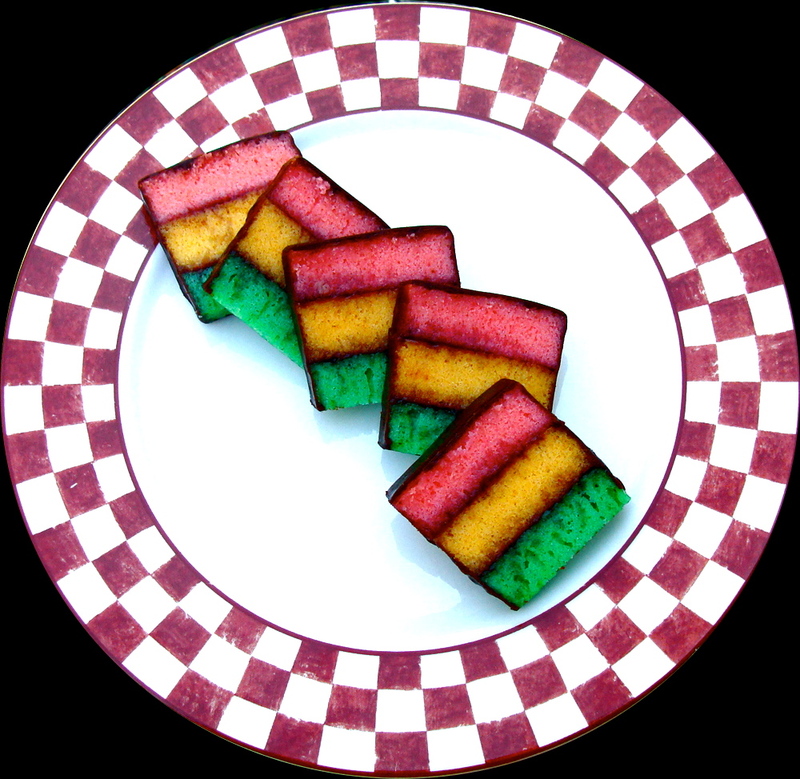 My daughter and I have been wanting to make the Rainbow Cookies for the longest time, and your recipe is the best so far. It's beautiful, and love the step-by-step direction photos. Just found your blog, tried to follow you back but there was no link to find you. Just noticed you now, on foodbuzz! Thanks for following my blog! >Wow! These are really amazing!! They look so yummy. I'm your newest follower and friend on Foodbuzz. Cheers! >This is so cute and beautiful! Love your photos! >These are my absolute favorite cookies. They look great! Elisabeth let me know how they turn out when you make them! >Wow, these look so professional! I've been meaning to make petit fours for tea sometime! >I am so prould of you! You have turned into an unbielivable..I am not even gonna say pastry chef b/c your an artist!! Love U!!!! >Thanks Emily! You should definitely try them! >OMG these are the most beautiful rainbow cookies i've seen so far and I love them. thanks for sharing. >I won these as part of the Foodness Gracious Blog auction…they're great! Thanks! My kids were so excited when we sliced open the first little cake. Meghan, I realize this post is not recent, but I want to try these, and i’m curious about how many sections you cut them into before glazing. It looks like 2, but the cookies on the plate look smaller. I cut them into two logs to show how I glaze them. I normally cut them into 3 sections before I glaze them. Really just depends on what size you want to make them! I hope you enjoy them!